Welcome back Spender! Looks like you brought someone special with you, pretty in pink. You must be exhausted these days. Please rest as much as you can. 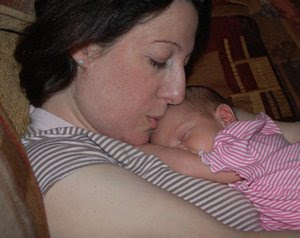 This pic of you and Kaitlin reminds me of the many paintings of the Madonna and Child. Very sweet. :) Hope you're getting lots of rest! I like the matching mommy-daughter stripes! And I thought the Spender will be too busy to blog after the baby. Happy this is not the case. Kaitlin Corner - sounds great.